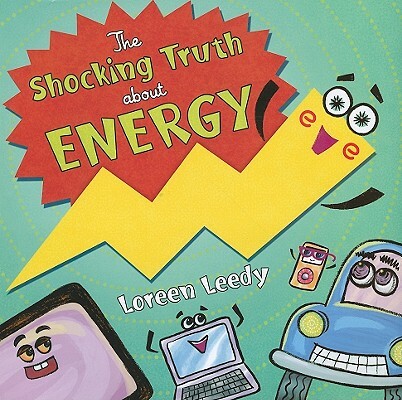 The Shocking Truth About Energy by Loreen Leedy. (Grades 2-4.) Holiday House, 2010. 32 pages. Review copy provided by my local library! This title has been nominated for the Cybils Award in Nonfiction Picture Books. This review reflects my opinion, not necessarily the opinion of the nominating panel. Energy. It's a hot topic right now and I'd bet it's going to stay that way. Open up The Shocking Truth About Energy and join Erg the lightning guy (okay, actually, Erg is "pure energy!") as he tells you about all the different methods for harnessing energy, how they work, and what their pros and cons are. From fossil fuels ("Good News: Fossil fuels contain a great deal of ENERGY. Bad News: Fossil fuels cause pollution. They are not renewable, so they will run out." pg 11) to wind power ("Good news: Wind power is clean and renewable. It's free and available all over Earth. Bad news: When the wind isn't blowing, no power can be made. Some people think wind turbines ruin the view." pg 19) and many in between, Erg examines how electricity is produced, including diagrams and facts. Erg covers fossil fuels, nuclear power, solar power, wind power, water power, geothermal power, and plant power. Erg also encourages readers to help save energy and gives many practical tips for how kids and families can cut back on energy use and WHY. Sections in the back of the book include additional information about energy and saving energy. 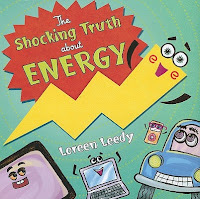 With brightly-colored pictures and simple (but not too babyish) diagrams and explanations, The Shocking Truth About Energy provides an accessible guide to energy for elementary students. This is a great resource for classroom units or reports on energy and the environment. I have to admit that Erg creeps me out a bit, with his sparkly eyes and his blushing e cheeks. However, it doesn't detract from the book, though I think the book would have been just as strong without him. Check out another review at Simply Science Blog. The Shocking Truth About Energy is on shelves now! And it's Nonfiction Monday, so head on over to Write About Now for this week's roundup!